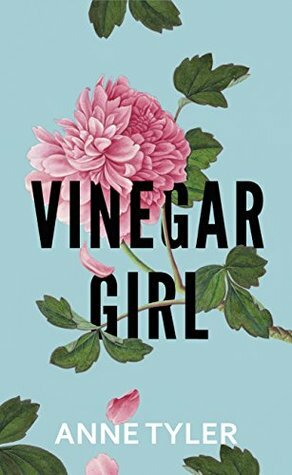 I received an eARC of Vinegar Girl from NetGalley in exchange for an honest review. As the world celebrates 400 years of Shakespeare, it only seemed right that I check out at least one of the books in the Hogarth Shakespeare series this year, and of the ones published so far it was Vinegar Girl that most captured my attention. I was expecting a tongue-in-cheek, clever little rom-com, but what I got was a trainwreck. One of the reasons Shakespeare is so popular and his work has lasted so long is because it's so universal. His stories include themes and tropes that continue to appear in our stories, and as such his work is constantly being retold and reinterpreted in different cultures, countries and times. Of all his plays, I'd say The Taming of the Shrew is one of the more difficult stories to adapt, particularly into a modern day setting. The idea of 'taming' a woman - of selling her off to the best person you can find in the hopes of finally selling off her prettier, more amenable sister - isn't quite the kind of story modern audiences, particularly modern female audiences, are interested in reading. So when Anne Tyler took on this challenge for Hogarth Shakespeare she certainly had her work cut out for her, and I wasn't sure how anyone could make this story work, but the idea sounded great. A scientist wants his headstrong daughter to marry his assistant before his visa expires so he can stay in the country and help her father with his research. Brilliant! That's such an imaginative twist on an outdated story. Unfortunately, the idea turned out to be far better than the execution of it. Firstly, Tyler's Kate just isn't Kate to me. At first she had promise. I was surprised to discover that the Kate in Tyler's retelling would be a teaching assistant but somehow it worked; she's stuck looking after other people's kids and while she might not be the best at the job the kids like her, and it's easy to see why. Tyler's Kate is a bit lost. She's a college dropout who has no idea what she wants to do and that indecisiveness has left her keeping house and home for her younger sister and her frustrating father. This would have worked so much better if Kate had a bit of gumption. Instead she lets her father walk all over her, and while she's rightly angry and upset when he broaches the subject of her marrying his assistant so he can stay in the country, the Kate I know would have had a lot more to say before she ran up to her room and wept. Not only that, but she actually agrees to the marriage about 40% of the way through the book. Gee, that shrew sure wasn't hard to tame. I suppose that's not really fair, as Kate mainly agrees to it because, once again, her horrible, useless, selfish father guilts her into it. Her 'love interest' Pyotr isn't much better. When I first read the synopsis of Vinegar Girl I assumed that her father's assistant would also be unaware of his boss's plan, but he was all for it! It didn't seem to bother him at all that this woman was sacrificing an awful lot to help him out, not that Kate's particularly endearing either; she seemed to have a few thoughts regarding foreigners and immigrants that just made me feel a bit uncomfortable given our current political climate. Kate doesn't have to be nice - one of the joys of her as a character is that she's past the point of niceness, she just wants to be left alone - but you have to be careful with what she isn't nice about. Kate does an awful lot of cooking in this book and appears to even be quite good at it, so why couldn't she burn the food? In fact if she's a good cook all the better, because then we know she's burned the food out of spite rather than incompetence. When the few times Kate is genuinely unpleasant have to do with immigrants it doesn't make her a sympathetic character, and considering her father is trying to get her to marry some guy she doesn't know because it'll help him out she should be a sympathetic character. The only member of the family who seems to have any sense is Kate's younger sister, Bunny, which is ironic really considering how often Kate and her father think of her as a nitwit. In fact Bunny felt more like the original Kate than Kate did. Once Kate's engaged she starts to think of this sham marriage as a chance for her to start afresh. Maybe she can go back to college and become a botanist - oh yeah Kate wants to be a botanist; it's mentioned, like, twice so clearly it's such a huge part of her life #not - but she only considers that after Pyotr suggests it. I know Kate's indecisive, but is she so indecisive that she needs this man she barely knows who she's being forced to marry to consider that possibility for her? That's not Kate! At one point Pyotr even says he's going to call her Katja - instead of, oh I don't know, her actual name - and Kate's response is to shrug it off and let him. That's. Not. KATE! In fact their whole 'relationship' makes no sense. Kate has her own job, she has her own income, and she never goes anywhere - the poor woman has no friends - so she must have some money saved. Why doesn't she just leave her horrible father's house? She could take Bunny with her, report her father to the police and go back to college part time. Clearly Vinegar Girl wouldn't be a retelling if that happened, but you can't ignore massive plot holes for the sake of a retelling - you just have to write a better retelling. Besides given what Tyler's done to Kate she doesn't seem to be that bothered about writing a true retelling anyway, because the Kate I know would never let things get like this. Then, right at the end of the book, Kate makes a sudden speech about how modern life is hard for men because they're not allowed to be emotional. If you think this review just took a sudden turn, then you'll feel an inkling of the confusion I felt when this sudden 'theme' appeared out of nowhere. Now as far as I'm concerned feminism is just another word for equality, and feminism works in favour of men just as much as women; men shouldn't have to feel like they need to be macho all the time, they shouldn't be ashamed to cry, but there was no place for that argument here. It was tacked on the end so badly that for a moment I thought I was reading the end of another book. I don't know how, but somehow Tyler managed to write a 21st century version of The Taming of the Shrew that's somehow less feminist than the original 16th century version. There was promise with this idea, but the execution was poor and the whole story's just a mess. If you want a good retelling of The Taming of the Shrew, just watch 10 Things I Hate About You instead. I'm glad I'm not alone. I thought Vinegar Girl was a mess too! It just made no sense to me that Kate would agree to the marriage, much less stick with it and look at it as a fresh start. Maybe Taming just can't be forced into a modern shape (although 10 Things I Hate About You pretty much proves me wrong on that score). This book wasn't nearly as cute as it tried to be. *high five* Exactly. I feel like Vinegar Girl completely missed the point of The Taming of the Shrew. Oh well! Sorry you didn't like this one. I hope your next read is much better!